Providing childrens magic shows and full party entertainment across Reading, Berkshire & surrounding areas. Hey! As if by magic you have landed on this site, so take a closer look around. With over 30 years experience, Brekk is known for bringing fun galore, providing stress-free parties with entertainment suitable for 3 years and above. 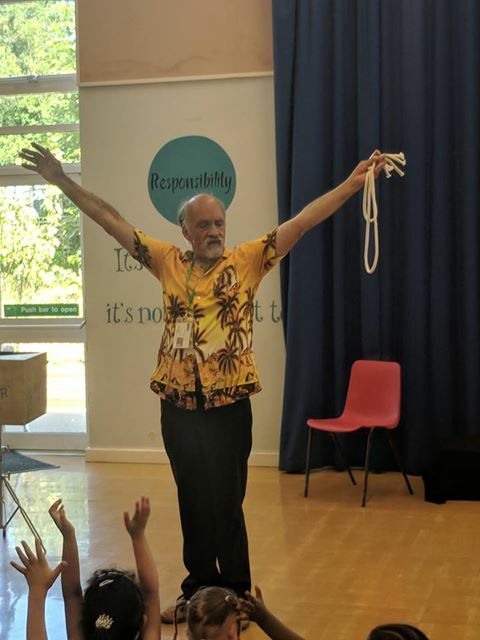 Magic, balloon modelling, music and non-elimination games, being reliable and punctual and his friendly approach is guaranteed to keep everyone entertained including the mums and dads. The knowledge he has gained will bring benefits to your special day. He has worked for many private parties and cooperative companies from DHL to Tesco, The British Military to Garden Centres. Parents said your the best childrens entertainer the’ve seen. Brekk kept the children entertained from the second he started to the second he finished. Thank you for being the highlight of the party. We were so impressed holding the attention of 18x 2 to 4 year olds. If you have specific questions, then please feel free to call me on one of the numbers below. Please note that as a full-time professional, you may be calling while I are performing at a party, so leave a message and I will get back to you as quickly as I can. Alternatively, please fill in the form on the right with as much detail as you can. Childrens magician Maidenhead, Woking, Bracknell, Wokingham. Childrens magician Guildford, Newbury, Slough, Windsor. Childrens entertainer Fleet, Ascot, Woodley, Twyford.